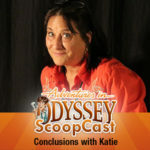 Your Servant Is Listening in Review: The ScoopCast begins a journey through Adventures in Odyssey Album 57: A Call to Something More. The team reviews “Your Servant Is Listening” in their own special way and shares insights about the latest AIO release. Also, stay tuned as we’re getting ready to give The Odyssey ScoopCast a brand-new home at its very own mini-site. More details to come!